Drones or Quadcopters were a popular Christmas gift this year. While many new drone owners are probably preoccupied with learning to fly without getting the propellers stuck in trees or crashing them over their neighbor’s fence, they need to take a moment to learn about the federal registration rules for unmanned aircraft. *Federal drone registration had been struck down by an appeals court in May of 2017, but the National Defense Authorization Act that was passed in December 2017 reinstated drone registration. Do I Have to Register My Drone? A person must notify an airport when they are flying within five miles of an airport. Label your drone with the registration number in case it is lost or stolen. This registration, which can be completed online costs $5 and lasts for 3 years. Fly at or below 100 miles per hour. Cannot fly from a moving vehicle unless you are in a sparsely populated area. Denote the make and model of your aircraft when applying for registration. The Small UAS Rule registration, which can be completed online costs $5 and lasts for 3 years. Traditional Aircraft Registration must be completed for any unmanned aircraft weighing over 55 pounds. The paperwork for drones greater than 55 pounds can be found on the FAA website and must be turned in via regular mail. Drones over 55 lbs will require an N-number that you have to submit to the FAA. The FAA website lays out the necessary information for an application. This registration costs $5 and lasts for 3 years. What is the Penalty for Flying a Drone Without Registering it? 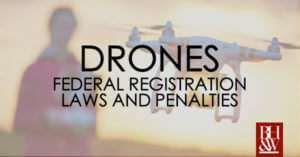 Failure to register an unmanned aircraft can result in regulatory penalties up to $27,500 and criminal penalties up to $250,000 and/or imprisonment for up to 3 years. Penalties are determined on a case by case basis and will vary based on the judge. Do you have to register your drone if you only fly over your own property? Even if flying over your own property, the FAA still requires registration of your drone. The penalties for failure to register an unmanned aircraft will apply even if the drone does not leave your property. What Other Drone Rules Should I Be Aware of? Every registration allows for different flight regulations, so pay close attention to what you register for and what that particular registration allows you to do. The FAA has developed an app called “B4UFLY” which gives you important information about your location and the flight restrictions in that area. This app is recommended by the FAA to help avoid violations of the registration limitations. For any additional questions/concerns, visit the FAA website.